The Glow Collection consists of products that help to even out the skin tone and visibly reduce the appearance of dark spots left over from acne. If you have active acne, check out our Flawless Collection. Genesis Sulfate-Free Foaming Facial Cleanser gently cleanses dirt and grime without stripping or disturbing the skin’s natural protective barrier. Ph Balanced and Formulated with soothing botanicals that hydrate skin and promote a healthy, even skin tone. Balance Skin Brightening Toner is a pH balanced, purifying facial toner that deeply cleanses pores by sweeping away excess oil, impurities, and any remaining residue after cleansing or exfoliating. 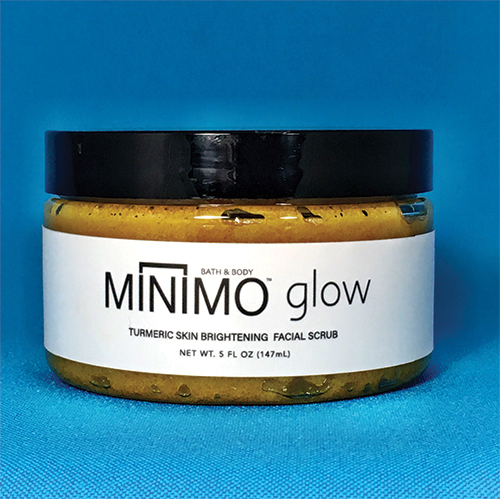 Fragrance and alcohol free, Minimo Balance is specially formulated to reduce oiliness and induce bright, healthier looking skin. Lumen Serum Dark Spot Corrector is a concentrated blend of vitamins and botanical extracts that help to target dark spots and acne scars on the face and body. Directions: Use 1 pump. Use finger to dap Lumen Dark Spot Corrector directly onto dark spots. You can also massage 2 pumps of the Lumen Dark Spot Corrector into the skin in a circular motion for overall application. Let sit for 5 minutes, then massage fully into skin in a circular motion until fully absorbed. If used in the morning, apply a sunscreen or product containing SPF after application (not necessary at night). Radiant Skin Brightening Daily Moisturizer is a hydrating combination of botanicals that promote a healthy, even skin tone. Maximum results with minimal effort: apply as the final step in a healthy skincare regimen as leave-on application that works throughout the day to provide a healthy dose of beaming benefits that help create a more glowing appearance.